Invicta Fighting Championships returns to the historic Scottish Rite Temple in Kansas City for Invicta FC 29 on Friday, May 4. The nine-fight card is headlined by a bantamweight battle between veteran Sarah Kaufman (19-4, 1 NC) and undefeated up-and-comer Katharina Lehner (7-0). Kaufman first appeared for promotion in 2013, earning Fight of the Night honours against Leslie Smith at Invicta FC 5 before joining the UFC’s bantamweight roster. When the 32-year-old Victoria, BC native returned to the Invicta cage in January, she blanked Pannie Kianzad en route to a unanimous decision victory. Germany’s Lehner burst onto the American fight scene in August, notching her first career finish, an impressive TKO victory over Alexa Conners at Invicta FC 25. Kaufman and Lehner will be competing for the Invicta FC bantamweight championship vacated by Yana Kunitskaya earlier this year when she signed with the UFC. In the co-main event, former No. 1 contender Pannie “Banzai” Kianzad (8-3) takes on bantamweight newcomer Bianca “Bibi” Daimoni (7-2). Kianzad, born in Iran and fighting out of Sweden, last headlined Invicta FC 27 opposite Kaufman, while Daimoni joins the organization after seven wins in Brazil, five coming by way of knockout. Following her successful debut at Invicta FC 28, Chicago’s Pearl Gonzalez (7-3) makes a quick turnaround to face Brazil’s Bárbara Acioly (4-2) at flyweight. Gonzalez moves up to 125 pounds after earning Fight of the Night honours for her strawweight tilt against Kali Robbins last month. Acioly will attempt to rebound from a loss to former Invicta FC title challenger Takayo Hashi. 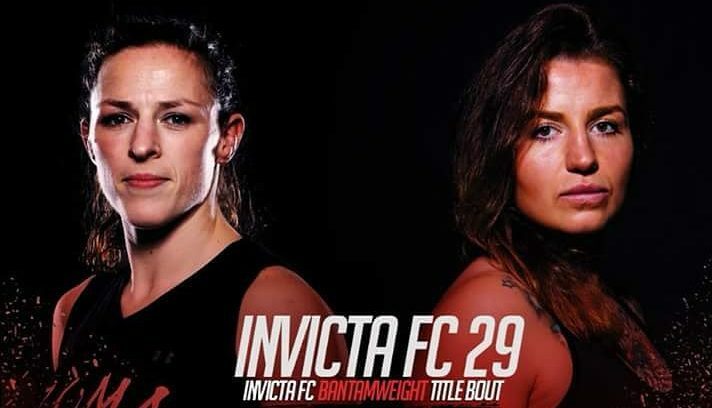 Invicta FC 29 will also feature two additional bantamweight bouts, as Julia “Raging Panda” Avila (4-0) throws down with Marciea “Black Widow” Allen (6-2), and prospect Yaya Rincón (2-0) squares off against pro debutant Lisa “The Strangler” Spangler (0-0). Avila boasts a resume including wins over UFC flyweight champion Nicco Montaño and UFC bantamweight contender Marion Reneau, while Allen returns to the promotion riding a three-fight winning streak that includes victories over veterans Carina Damm and Jan Finney. Turning pro after a 9-1 amateur career in the Pacific Northwest, Spangler looks to spoil Rincón’s unblemished Invicta record. Liz “The Titan” Tracy (4-2) faces fellow flyweight Cheri Muraski (4-1). American Kickboxing Academy product Allison Schmidt (1-0) and Macy Chiasson (1-0) fight at featherweight. Former Tuff-N-Uff flyweight champion Helen “Iansã” Peralta (1-0) meets former Tuff-N-Uff strawweight champion and Taekwondo black belt Cheyanne “The Warrior Princess” Vlismas (1-0) at strawweight. Eighteen-year-old Croatian prospect Adriana Vuković (0-0) will make her pro and promotional debut against an opponent to be named shortly. Vuković trains out of Tristar Gym and holds numerous amateur titles in Brazilian Jiu-Jitsu, kickboxing and MMA. Invicta FC 29 streams live and exclusively via UFC FIGHT PASS Friday, May 4.